Two of France's best-known rappers were set to spend a second night in custody Thursday, a day after a brawl between them and their entourages delayed flights at a Paris airport. "The video investigation is continuing," they told AFP. Aeroports de Paris (ADP), which manages the capital's airports, said the fight had damaged Orly's image and "endangered the lives of others." ADP added the disturbance had meant it was not possible to place a security cordon around an abandoned item of luggage. According to Kaaris' lawyers Arash Derambarsh and Yacine Yakouti, the rapper, who was accompanied by six people, was surrounded by "a dozen people who have nothing to do with music and were just looking for a fight. "He was taken aside by Booba, who insulted his child and his wife. Then they all jumped on him. You see it on the videos, they were three against one," said Derambarsh, who said his client reacted in self-defence. 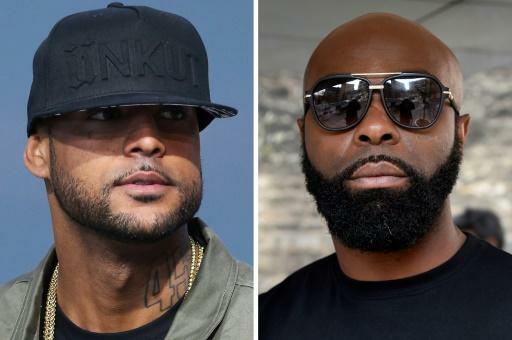 Booba's lawyer Yann Le Bras responded by telling BFM TV the video footage showed it was Kaaris and his group whose behaviour had been "very aggressive". Booba, one of France's most popular rappers, has reportedly fallen out with Kaaris in the past after failing to support him in a dispute with fellow French artist Rohff. Booba has also been involved in other fights in recent years -- notably with La Fouine with whom he clashed in Miami in 2013. Some rapper spats have turned fatal in the United States where hip-hop singer Christopher "The Notorious BIG" Wallace was gunned down in 1997, a year after Tupac Shakur suffered a similar fate. Booba, whose often raw and violent tracks evoke life on the street in the Paris suburbs, symbolically "killed" Kaaris, La Fouine and Rohff, depicting their decapitation in an animated clip for his track "Gotham," in which he appears as Batman.